Chances are your home uses forced-air heating. While this type of system may be the most common, it has always suffered performance drawbacks. Today, with the availability of better-performing technologies, many homeowners are considering a switch. Find out why so many homeowners are dissatisfied with their forced-air heating—and what they're replacing it with. Visit any assortment of American homes built in recent years and, though you’ll probably see a range of architectural styles, all are likely to have only one type of HVAC system—forced air. For decades—ever since it first rose to prominence in the wake of the Second World War—forced air has remained a default choice. Indeed, many homeowners are so accustomed to forced air that they mistakenly believe it’s the only way to keep a home comfortable in the cold months of the year. Given the ubiquity of forced-air heating, it’s often the case that when homeowners complain about their heating—its hit-and-miss performance, its high monthly costs—they are, without necessarily knowing it, criticizing forced air in particular. But throughout Europe and Asia, and increasingly in the United States, homeowners are discovering an alternative in radiant heating. A new technology with ancient roots, radiant heating surpasses forced air in a number of persuasive, important ways. Keep reading for more information about why so many homeowners are fed up with forced air, and then learn how radiant heating improves upon that increasingly outmoded technology. The bottom line is, radiant heating offers a wholly different—and more comfortable—experience, and operates at least 25 percent more efficiently than its predecessor, representing a dramatic step forward in home heating. It may even change your assumptions about what in-home warmth can be. A forced-air system works by blowing furnace-heated air into a network of supply ducts, which in turn deliver the air to the various rooms of the house. Once it cools, the air re-enters the ductwork through return registers, finally reaching the furnace, where it will be heated and circulated again. Though this technology is widespread, the notoriously inefficient operation and uneven heating of such systems can be traced back to fundamentally flawed aspects of their design. Uneven heating. In a room heated by forced air, it’s warmest right near the vent. In fact, it might very well feel a little too warm there. Meanwhile, on the other side of the room, you could easily find yourself needing a sweater and a blanket to keep warm. Simply put, hot air is difficult to control. It is not evenly distributed and it will always rise to the ceiling or second floor. So, in the end, your comfort basically depends on your location relative to the nearest vent, or whether you are upstairs or down. Noisy operation. Traditional forced air calls no small amount of attention to itself. It cycles on and off, creating not only uncomfortable temperature swings, but also a great deal of noise. When the system kicks on, warm air roars into the room and interrupts conversation (or sleep) before, minutes later, grinding to a halt. Then, once the room has cooled down to a threshold point, another loud blast invades—and this annoyance continues all winter long. Poor air quality. Though intended to channel warm air through your home, ductwork also often ends up collecting and distributing dust and other impurities, including germs. At the same time, the air recirculation that occurs in a forced-air system inevitably leads to stale, dry conditions. 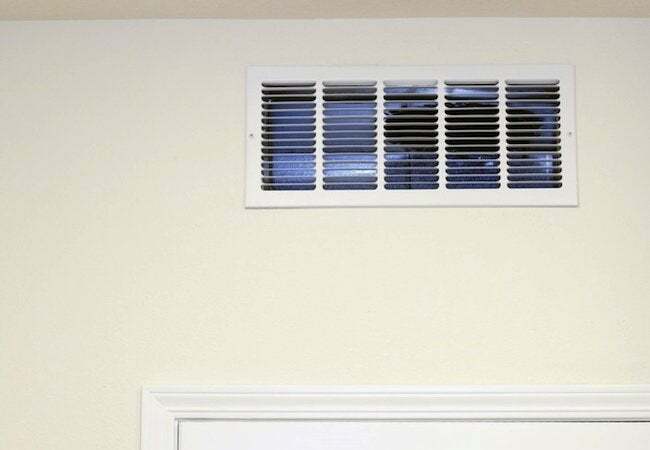 You’re probably no stranger to “scratchy” indoor air in the winter. But such unpleasantness is not inevitable. Rather, it stems directly from a heating technology that relies on warm, blown air. Energy inefficiency. Why does home heating cost those with forced-air systems a small fortune over the winter months? A primary explanation is that ducts are imperfect. Their tendency to leak—even if only through the joints that connect sections—compromises overall system efficiency. To make up for the heat loss, the furnace must work harder and consume more energy to maintain the target indoor temperature. You’re essentially paying extra to correct the flaws of the system. Technology has improved by leaps and bounds in nearly every avenue of life, including HVAC, and savvy homeowners are beginning to look beyond traditional forced air—a search that has led them to radiant heating. Though it’s been around, in one form or another, since the days of the Roman Empire, radiant heating hasn’t always been a viable whole-home heating option. But today, thanks to contemporary manufacturers like Warmboard, many would argue that radiant heat now outperforms its peers. While circulating air plays the central role in a forced-air system, water serves a largely similar function in hydronic radiant heat. In a radiant system, after water is raised to a target temperature by a boiler, it’s pumped through a network of tubes that are set into panels beneath the flooring of the home. The water-fed tubes transfer heat to the panels, which then radiate heat outward to materials and objects in the room—first the floor, and then the furniture and people occupying the living space. Uniform heating. By virtue of the expanse of panels underlying the flooring, radiant heat delivers warmth across virtually every square inch of space. So, no matter where you’re positioned in a room, or even as you’re moving from one room to the next, you can expect the temperature to remain consistent. 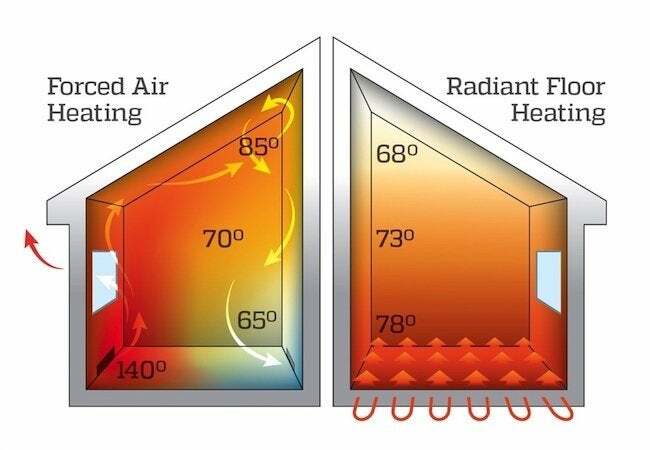 Plus, in contrast to forced air, there are no uncomfortable swings in radiant heating; the comfort concentrates not in the air above you, but near the floor, at the level you actually inhabit. Peace and quiet. Many homeowners insist that appliances like dishwashers ought to run quietly, but they seem to have lower expectations when it comes to home heating. People may assume that noise and heat go hand in hand, but they do not. Radiant systems deliver steady, all-encompassing warmth, and they do so in complete silence. In other words, you will be aware of your heating system only because you’re so comfortable, not as a result of the noise it’s making. Superior air quality. For allergy sufferers and others concerned about indoor air quality, radiant heat can be like a breath of fresh air. First of all, the design of the system involves zero ductwork, which results in a dramatic reduction in the amount of dust wafting through the home. Second, radiant heating operates in a way that does nothing to detract from the moisture content of the air. That means you can bid farewell to the dry conditions that cause red eyes, sore throats, and dry sinuses! Energy savings. Because it’s ductless, radiant heat maximizes energy savings by minimizing heat loss. Not all radiant systems are alike, however. They all offer efficiency, but the right components can make a big difference in your monthly bills. Take Warmboard, for instance. Its panels are made not with sluggish concrete, but rather aluminum. Because aluminum conducts heat so effectively, these panels require the least energy of any radiant system and reach the set temperature more quickly as well. Though radiant heat is still relatively rare in the United States, that situation is changing. More and more homeowners are ditching forced air and switching to radiant heat, because the newer technology excels where forced air falls short. Whereas home heating used to entail a choice between comfort and savings—and certain negatives were seen as unavoidable—radiant heat proves that you don’t have to settle for anything less than even, “everywhere” warmth that remains silent and dust-free while dramatically lowering energy bills.